Summoners War is celebrating its 5th anniversary! We've prepared FIVE awesome events, so make sure to check each event's schedule and participate. Collect points every day to level up skills of default 4★ Monsters! * You can't acquire points from the World Arena. * Summonings performed with Summoning Pieces won't count. * You can collect up to 500 points every day. * You can check your point status in real-time at the My Points. ◎ Get rewards based on the points you acquire every day! > Select a default 4★ Monster within the event page. > Level up a skill with 2,500pts. * You can't select Monsters that completed all skill level ups. * You can select only default 4★ Monsters. * A random skill will be leveled up. ◎ Get special rewards based on the total points you earned! ◎ Get bonus [Mystical Scrolls] based on the no. of Premium Pack purchases during the event! ◎ 5 Monsters are waiting for your challenge! You can choose only 1 Monster during the event, so choose wisely! ※ A reward will be sent to your Inbox when you log in every day. You have to collect all items within 22 days of your first login. ※ Each reward has a Summoner level limit. A reward will be sent when you log in after reaching the designated level. ◎ Get additional Glory Points/ Guild Points by the amount you earn during the event! ※ You can get up to 500 Glory Points and 500 Guild Points. ※ Glory Points and Guild Points can be earned by units of 50. * [Skill Level Up Event] You can acquire up to 500 points. * [Skill Level Up Event] Points Acquired Today resets every day at 8am PDT. * [Skill Level Up Event] When you claim the Splendid Blessing of Summon, the item will be used instantly when you summon a default 5★ Monster. * The rewards will be available for 24 hours after the event ends. 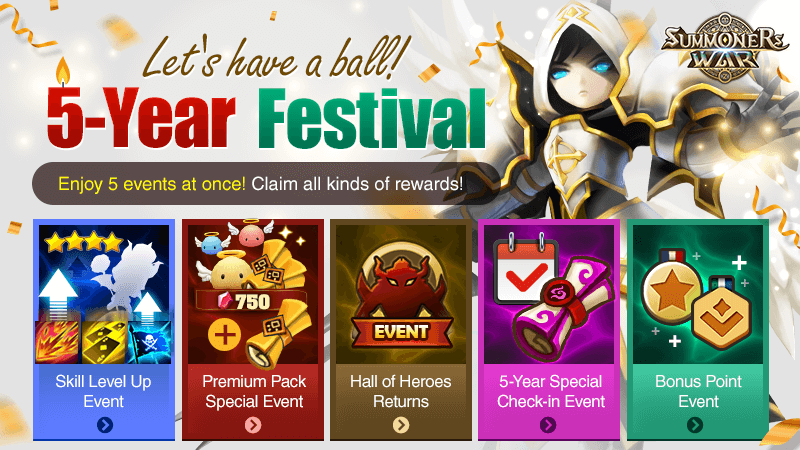 Events 1 & 5 are quite nice, event 4 is OK, event 2 seems to be poor and the special HOH is really dissappointing. Overall the anniversary it´s OK, I only would have expected a better HoH picks.